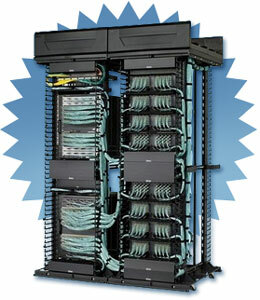 If you’re looking for a cable management system, look no further than the Panduit Cable Management System. At www.TWAcomm.com you can find all the systems you could need and there are plenty to choose from. Panduit Front and Rear Vertical Manager holds up to 24 Category 6 cables! It prevents snags, kinks and crushing by bending radius control into fingers. It has dual hinged covers, molded construction and snap on cable retainers. The Panduit Vertical Cable Manager comes with 4 PRSP7 slack spools as well as 45 rack spaces. The Panduit PatchRunner Vertical Cable Management System, model # NCMV8 has four spools to manage slack for 8” to 12” product. Angled modular patch, molded cable, rack spacing identification and a load ratio of 800 lbs. Consider the Panduit 2 Rack Space D-Ring Cover. It is open and efficient with a patented D-ring design. It’s width is 19.5”. It snaps on and can be mounted to 19 inch cabinets and EIA racks. It has pass through holes and a snap on cover. If you’re in the market for a Panduit Standard Cross Section Hook and Loop 35 roll 10 pack, you can find it at www.TWAcomm.com. Model TTS-35RXO has several features that you might want to check out. It has standard cross section, it’s CE compliant, it comes in black, it’s RoHS compliant and the hooks and loops are locking style. It is also cost effective, adjustable, reusable and releasable. It’s thin, flexible and strong, and comes in a plastic case (TTS20). It comes with complimentary mounts, nylon loop and propopylene hook. The Panduit Patch Link Horizontal Cable Manager has some really great features. Model number WMPLFSE is light weight, durable and easy to install. It mounts to standard 19 inch cabinets and racks. It has front and rear cabling holes, flexible fingers, rounded edges and dual hinged covers. It has a larger area for Category 6 cables as well as #12-24 and M6 counting screws and covers. Panduit Front Only Vertical Manager, model number WMPVF45E is another fine product with many special features. Go to www.TWAcomm.com and see it for yourself. This one has some fine features to prevent crushing, snags and kinks, molded construction, dual hinged covers and cable retainers. The Panduit 2 Rack Space D-Ring Cover, model # CMPH2C comes with a snap on cover. The D-rings make management both efficient and open. It is 19.5 inches wide. It has front to rear access and flexible design for changes, adds and moves. The Panduit 2-Rack Space D-Ring Cover also comes with an optional snap on cover and hardware. You can easily mount it to 19 inch cabinets and racks. The Panduit Module Grounding Kit, model number CJSGK-X is just what you need for grounding applications. It doesn’t matter what your cable management needs might be or whether your company is large or small, www.TWAcomm.com can show you a good selection at prices that will please you. For all your Panduit needs, this is the place!